Gymi is a health club for children and teenagers. We offer a variety of instructed classes for all ages, starting from babies up to adults. Exercising at Gymi is healthy and safe as well as fun and rewarding! Our goal is to be a part of families’ lives and enhance the health and well-beeing of children, teenagers and adults. We at Gymi want You and Your child to learn new skills. That is why the curriculum is planned according to the child’s or teen’s level of development and age. If You cannot find enough information on this website, please contact the Gymi of Your choice. 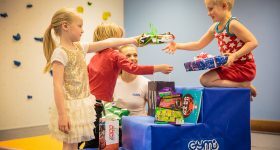 Gymi organizes day camps during school breaks. 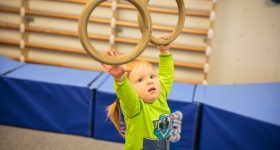 Camps are for girls and boys and consist of different kinds of sports: gymnastics, circus tricks, yoga, parkour and games. Groups are small to ensure individualised teaching and learning of new skills. Camps are fun and inspiring! 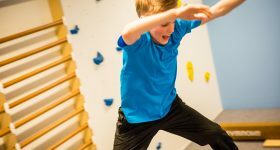 * Monday to Friday at 9-15 (Gymi open daily 8.30-16.30): program includes parkour, yoga, circus and gymnastics. * Own lunch will be eaten during the day. We at Gymi want You and Your child to learn new skills. That is why the curriculum is planned according to the child’s or teenager’s level of development and age. To be able to keep our promise of teaching quality and learning, we keep our groups at Gymi small. Groups with children under 6 years old have a maximum of 12 participants and groups with children over 6 years old have a maximum of 15 children per instructor. Children are not insured by Gymi. Gymi AfterSchool is an afterschool club for children aged 6-12 years. 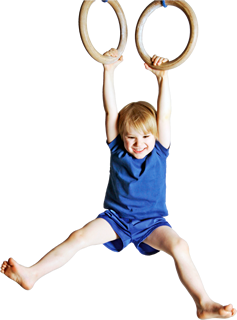 The multiple activities include doing homework as well as arts and sports like parkour, circus, dance, yoga and gymnastics on the apparatus. If there are several children coming from the same school, transport can be organised. Gymi is easily reached by bus or metro. Gymi Family class is an open gym where there is no instruction. It’s for you and your family to play and train by yourselves. Lots of fun! For example children´s birthday party (1,5-2 h). Ask about the popular birthday packages and other parties! Choose Your favorite program for Your Party: Parkour, dance, tricks on apparatus, circus or yoga. PLEASE contact your nearest Gymi for more information.